The microdisplay can be used in a similar way to an HMD, for microsurgery applications. 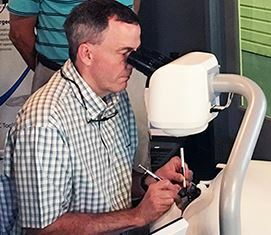 In the case of Image Injection, surgeons view the area to be operated in their optical microscope with an injected overlay of another image (e.g. an MRI scan), a technique called image-guided surgery. The high-resolution and high brightness offered by our ISO 13485-certified microdisplays enable accurate full colour images to be generated with precision. Despite the high brightness requirement the microdisplays do not suffer from image burn-in, degrading contrast or ghost images. Segmented images can easily be overlaid onto a surface as seen through a surgical microscope. When combined with our microdisplay the microscope becomes a more powerful tool and permits users to navigate the desired surface in real time with a degree of accuracy second to none. Digital 3D surgical microscopes replace the optical path which is useful in a remote surgery application. For medical training of doctors simulated surgical microscopes are used to enhance their skills by repetitively performing surgeries. Cinoptics is one of our long-term clients for this application. Typical Board Level Products SXGA-R5, QXGA-R10, 2k-R10.